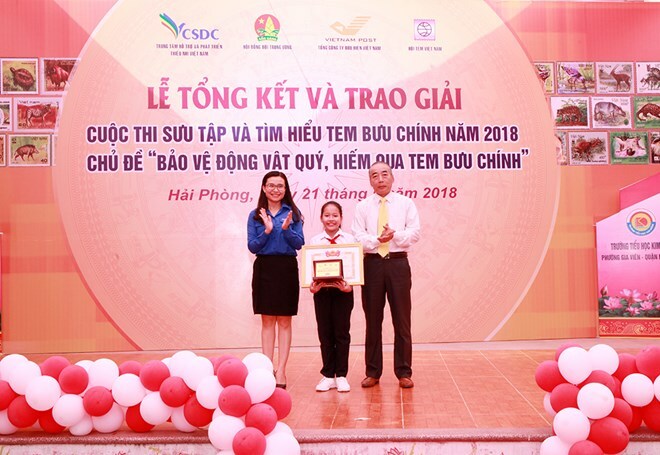 Hai Phong (VNA) – The 2018 postage stamp contest for children and teenagers aged 8-15 has come to an end with 54 prizes presented, including one special prize, two first and four third prizes. Another 15 prizes were awarded to groups of contestants and organisations who made outstanding contributions to the competition during an award ceremony in the northern city of Hai Phong on May 21. Five “A” prizes for groups and organisations went to the Ho Chi Minh Young Pioneers Organisations from Hai Phong, Bac Giang, Quang Nam and Tien Giang. This year’s competition aimed to encourage protecting rare and endangered animals through postage stamps. Some 2.1 million entries were sent to the contest by kids nationwide from December 2017 to April 2018. The Vietnam Post has issued many collections of postage stamps on animals to raise people’s awareness.